April has been a blast so far. What a beautiful time of year. The dogwoods and azaleas have been just spectacular. The spring wildflowers are showing off. Come to Tyler and enjoy all there is to do and see. Staying with us at The Rosevine Inn is such a big part of the fabulous experience you will find. Some of what is coming up for the next few weeks will be highlighted below. 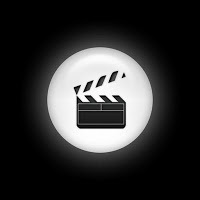 2011 Kilgore Film Festival featuring 6 classic films! Listings will be posted as we receive them. The Children’s Park 2nd Annual Teddy Bear Picnic will be held on April 17, from 11 a.m. – 2 p.m. at The Children’s Park located at 900 South Broadway in Tyler. Play stations will be set up throughout the park to include storytelling, music with instruments, bead critters, flower planting, hunting for marbles and many opportunities for photographs. Parents should bring a blanket and picnic lunch for their family. Children should bring their favorite teddy bear and a $1 donation for the park. More Fun for the Kids!! This is a great time for families to get together. All children will only be using two ball fields this year and hunt according to age groups:the first hunt beginning at 7:00p.m. Ages are 3-10years. (No strollers will be permitted on fields). There will be games, a magic show and free refreshments. Don’t forget to bring your child a basket it or bag for the hunted goodies. This is FREE event open to everyone! 15,000 eggs! Bring your own basket and flashlight. Still MORE for the Kids!!! Enjoy a relaxing train ride on The Easter Beagle Express! During the train ride you will meet Snoopy, enjoy a live reading of the book, “It’s The Easter Beagle, Charlie Brown.” At the depot during lunch, enjoy Easter Egg Crafts, take pictures with Snoopy, and listen to live musical entertainment. It is a fun event for the whole family! THE OIL PALACE PROUDLY PRESENTS LOVEWELL LIVE TOUR – MERCYME * BRANDON HEATH * NATILIE GRANT, FRIDAY, APRIL 22ND! Doors open @ 6:30PM and show starts @ 7:30PM! Thats right, MERCYME is coming to Tyler Texas on thier Lovewell Live Tour! They will be performing songs off their latest project The Generous Mr. Lovewell (INO Records) where they have been singing songs off the new album including their recent single “Beautiful.” “Beautiful” has been heard on radio stations across the country and is continuing to climb the radio charts taking the No. 6 spot on AC Indicator and No. 10 on AC Monitored! Also performing will be BRANDON HEATH and NATILIE GRANT! Easter Egg Hunt at Our Saviour’s Lutheran Church. Egg Hunt for TODDLERS – 6TH GRADE. Games, Food and Fellowship for ALL AGES. For more info call 903-561-1865. LET THE TRUTH BE TOLD is a hit stage play starring El DeBarge Jr., American Idol George Huff and Universal Soul Circus actress Lisa Pierce, Avery Sutton and many more. EXPLORE THE LIVES OF THREE OLDER SISTERS, (LIL, MAE MAE, & BETTY) WHO ALL HAVE PERSONALITY DISORDERS AND IMPERSONATE STARS OF TODAY. ON THE WEEKEND OF JUNIOR’S WEDDING, THE THREE SISTERS DECIDE NOT TO TAKE THEIR PROZAC AND EVERYTHING GOES CRAZY. LEAVING THE DARK FAMILY SECRET VULNERABLE TO BEING EXPOSED. It’s here, and it’s “AN ELLE OF A SHOW” (TIME Magazine). 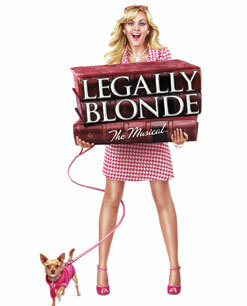 The hilarious MGM film is Broadway’s new smash hit musical, and now LEGALLY BLONDE THE MUSICAL is coming to you. LEGALLY BLONDE follows sorority star Elle Woods, an underestimated blonde who doesn’t take “no” for an answer. When her boyfriend dumps her for someone more “serious,” Elle puts down the credit card, hits the books, and sets out to go where no Delta Nu has gone before: Harvard Law. Along the way, Elle proves that being true to yourself never goes out of style. After turning Broadway and MTV hot pink, this Feel-Good Song and Dance Juggernaut (New York Magazine) is The Best New Musical Around! Hundreds of Families Selling: Household Items, Appliances, Electronics, Furniture, Linens, Outdoor Equipment, Clothing, Hunting Gear, Kids Toys, Gym Equipment, and much much more! Over 150 Sellers! Consignment Only. Must register as a seller to bring items. The ASSIST Autism Foundation is having A Friday Night Dinner Event on Friday the 29th of April in connection with the Symposium. The fee is $55 per person. Plated dinner will be served, cash bar, music, dancing and entertainment. Use this opportunity to network with attendees away from the exhibit hall! Autism Now! Hope, Healing and Autistic possibilities is brought to East Texas by the ASSIST Autism Foundation. We have assembled some great speakers from around the USA and Canada to come and share cutting-edge information with educators, health care providers, caretakers, parents and families. They will conduct presentations in the areas of biomedical interventions, research, behavioral and developmental therapies, nutrition and diet, family issues and educational opportunities for anyone who handles children with Autism as well as children with Asperger’s Syndrome, ADD, ADHD, Lymes, Tourettes, OCD, and PDD. ***Event times may vary on Saturday and Sunday. The stage for the 4th Annual Cause for the Paws concert to benefit the Humane Society of East Texas. On Saturday, April 30th, Miranda takes the stage On the Square in Tyler joined by special guests Stoney LaRue and Josh Kelley. Tickets go on-sale Friday, February 25th at 10am and are available at www.outhousetickets.com. 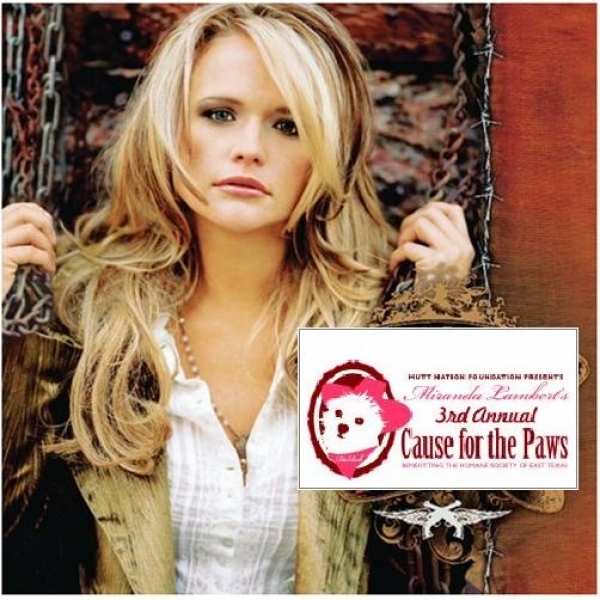 Gearing up for its 4th annual show, this year’s Cause for the Paws is shaping up to be the biggest ever. In addition to recent Grammy winner and ACM nominee, Miranda Lambert, the show features Red Dirt musician, Stoney LaRue, Top 40 country artist, Josh Kelley, as well as additional local favorites. Together with a huge stage, and giant video screens, this show has the makings of a spectacular concert, the likes of which, Downtown Tyler has yet to see. Over the years the concert has raised thousands to benefit the Humane Society of East Texas, enabling it to become a no-kill animal shelter. One of Miranda’s own dogs, Delilah, is a product of the HSOET making this event especially dear to Miranda and her MuttNation Foundation. This year’s live and silent auctions include a variety of artist signed items. 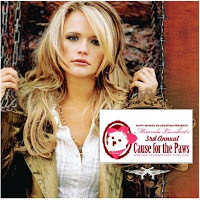 Miranda’s love of animals led to the formation of MuttNation. The foundation has successfully raised money across the country aiding organizations and governmental institutions or entities whose purpose is to build animal shelters for better care; increase pet adoption and encourage responsible pet guardianship; rehabilitate sick or unsocialized animals; fund spay/neuter programs; reduce/eliminate euthanasia of healthy animals; and train shelter dogs for purposes of therapy programs, assistance for wounded military personnel and dogs-in-prisons programs. This year’s Cause for the Paws is sure to be the biggest and best yet. Tickets are $65 for PIT standing room only, $65 for the Gold Reserved Section, and $25 for general admission. Tickets go on sale Friday, February 25th and are available at www.outhousetickets.com. Donations can also be made at www.muttnationfoundation.com. This year’s Cause for the Paws is sure to be the biggest and best yet. Tickets are $65 for PIT standing room only, $65 for the Gold Reserved Section, and $25 for general admission. Tickets go on sale Friday, February 25th and are available at www.outhousetickets.com. Donations can also be made at http://www.muttnationfoundation.com/. Five distinctive sites in the Greater Tyler area have been selected to be featured on the annual Home Garden Tour. 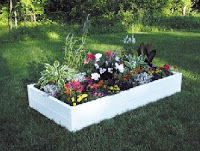 These home gardens are all spectacular in their own right! Tickets available at any of the home garden locations, $10 in advance, $12 day of tour. This is really lots of fun and informative , too!! The East Texas Symphony Orchestra opens its final rehearsal for its evening subscription concert to the public free of charge. Or go to the Concert!! Join the East Texas Symphony Orchestra for its season finale as the orchestra says farewell to Music Director and Conductor Per Brevig. The concert includes music of Brahms, Respighi, David, and Mendelssohn. Joining the orchestra are guest soloists Elena Urioste (violin) and Derek Hawkes (trombone). The concert also includes the ETSO annual Side by Side student performance. Selected by audition, these young musicians will play Brahms Academic Festival Overture with the ETSO. Ticket prices range from $10 to $55. They are available from the UT Tyler Cowan Center Box Office, 903.566.7424, or online at www.ETSO.org. 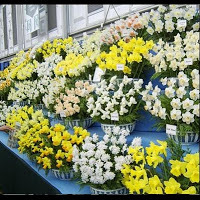 Don’t Forget Canton Trade Days is April 29-May 4!!! So once again there is plenty to do in Tyler & we have the perfect place for you to stay while you enjoy all the goings on. Oh -once last thing! This entry was posted in Uncategorized and tagged Azalea Trails, Canton Trade Days, Cowan Center, East Texas Symphony, Music in East Texas, Rosevine Inn, Shopping, Texas State Railroad, Tyler Things to do by admin. Bookmark the permalink.